A Daily Diary: Ups and Downs. 1:36 p.m. The title pretty much sums it up. I've had some highs and lows so far this week. Let's get the bad ones out of the way first, shall we. I'm sick. I've been sick for the past few days. I've had times where I feel like my skin is hot, but I'm still cold. I've been in and out of zombie mode. Huge lack of energy...like when I lay down and it takes some work to will myself to even move. Sore throat. Bad sleep, or strange sleep really, where I'd drop in and out of back to back lucidity but not quite REM sleep. Headaches. Lack of appetite. I've been eating and drinking my fluids. The biggest climax today though was I coughed up a literal 'chunk' of mucus which had been absentmindedly blocking much of my airway. I praised God that was out of me, at least. My urinary bladder is still on the fritz at night on top of all of this. My family has been showing very kind concern over this and I am grateful for it. I'm also actually glad that Harmony and Aaliyah had their plans booked for this weekend and the next, (Lani's sleepover, which already happened, and then to their Dads houses) and thus were not able to come over to visit anyway. The highlights were that I bought a 50-pack of DVD-RWs from Wal-Mart for 20 bucks. The first couple ones didn't work but I wound up at LEAST getting the Tudors Music Videos on there. Word is still out on trying to get the home movies on them. i'm glad I didn't go with the ten pack given these circumstances, even better that I'll easily be able to make multiple copies. Made some interesting things on Secondlife, including a 'blinged out' car I'd been working on for days. Believe it or not, that took a LOT of energy that I've been lacking in lately to get through. Especially detail wise. I custom made my own designer necklace inspired by Louis Vuitton. Not for profit, of course. 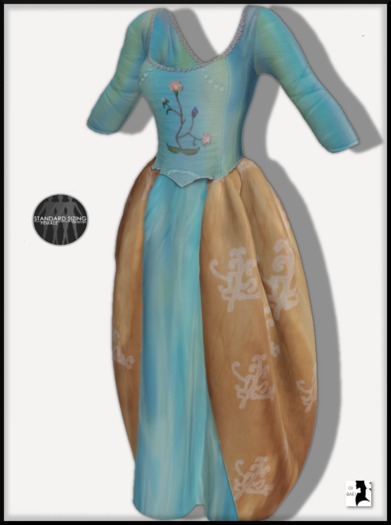 As well as made a new gown inspired by Natalie Dormer's beautiful Anne Boleyn costume. After almost three years of work, I FINALLY COMPLETED my Blurb journal, which will have to wait until I can afford to upload it. Oi. That will have to wait because the lindens I have saved up are going towards getting a CUSTOM mesh I've been wanting for a really really long while now. You might even say it's a godsend. It's costing me 7K lindens (half up front, half when finished, or 26 US dollars total including cash-out fees.) I expect I'll be seeing the finished job in about a week and really looking forward to it. God enormously blessed me with financial success on Secondlife, so I can only thank Him for making this possible. Will really help with this new goal I've had. In fact, I don't even have the full amount for the second half yet. I need 3,500L and I have about 3,100L. (ie. I'm short about $1.50 US.) I am taking it on faith that the lindens would be there within a week's time, even then I can usually borrow off Rob or April. So praise God. :D The search should be over after this. Also, been catching up on Buffy/Angel episodes, as well as getting up to date on Supernatural. Writing has been off and on and I think I really found that this story could be worth continuing, when I feel up for it, I guess, given unwellness. Well, unless I think of more. I'm updated. God bless, Jesus loves, lives, saves, homies! Baiiii!